Mr. Milton has worked at BHS for the last two years as a permanent sub and we feel very fortunate to have added him as a fulltime staff member this year. 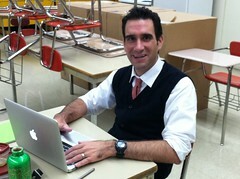 He is certified in both English and History and is teaching courses in both departments this year. After graduating from Rhode Island College with a BA in Education, I returned to City Year, an AmeriCorps program working in public schools. At City Year I was responsible for training our AmeriCorps members, managing a team of twenty AmeriCorps members, and overseeing the overall relationships with the schools and other non-profits we worked with. While my mother says I was destined to be a teacher, it wasn’t until my gap year as an AmeriCorps member that I realized this was true. I was teaching an economics curriculum to elementary and middle school students when I received a series of thank you cards from my former students - one of them said, “Mr. Milton, you were a great teacher.” At this point I realized how much I enjoyed teaching and then went on to earn my degree in education. I really enjoy the sense of community that I get from working at Burlington High School. I have actually been here for the past few years as a building substitute and a long term substitute in both the Social Studies and English Departments. I have found my colleagues to be helpful and friendly - whether it is to bounce around ideas, to observe my teaching (and give feedback), or to lend me a projector. I have found the students to be motivated and inquisitive learners. I really feel lucky to be a part of BHS and also enjoy the rather short commute. In Providence, I was the captain of a bocce team that earned back-to-back championships in a league on Federal Hill. It was literally epic and should probably be made into a movie. One time, I got a hole-in-one on the 5th hole at a mini-golf course. I was actually aiming for the 4th hole at the time. Oddly, while I had the best shot of the game I did not win. We're so grateful that you're here. You have been a tremendous help to me with technology this summer during the Tuesday Ed Camp sessions and especially during this weekend via Twitter with Noterize and Dropbox!! Thank you for all of your help.